A Florida man was charged with marijuana possession and a license plate light violation that got him pulled over in the first place. However, it's not why he was arrested, but how that's catapulted this moving violation into the limelight. 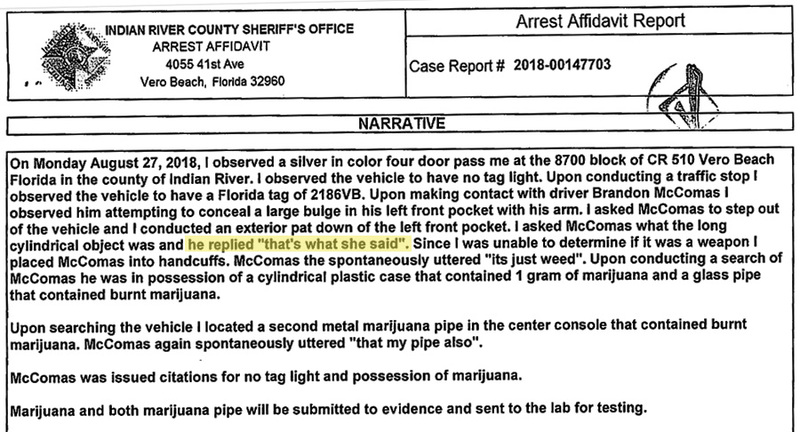 According to The Smoking Gun, Brandon McComas was driving a silver sedan in Vero Beach, Florida, on Monday night when a sheriff's deputy noticed his car's license plate light was out and proceeded to signal the driver to a stop. As the arrest report shows, the deputy approached the driver's side door and quickly noticed McComas "attempting to conceal a large bulge in his left front pocket." As a result, the deputy conducted a pat-down search on McComas, fearing that the bulge might be some kind of weapon that could be used against him. When McComas was questioned about the large bulge in his pants, he simply replied: "That's what she said." Unhumored by McComas' portrayal of Michael Scott from The Office and unable to determine what the bulge was, the deputy placed him in handcuffs and conducted a thorough search. "It's just weed," McComas allegedly said once the search began, and a more extensive search revealed that the bulge had nothing to do with McComas's male anatomy, but that it was a cylindrical plastic case containing marijuana and a small glass pipe. A subsequent search of his car turned up a second pipe that McComas reportedly claimed was his. The 31-year-old male was arrested for marijuana possession and cited for the defective license plate light. He was released Tuesday morning on $500 bond and awaits trial. Monday night wasn't McComas' first time behind bars, as his record includes charges for disorderly conduct, domestic battery, disorderly intoxication and cocaine trafficking, for which he spent three years in a state prison.